As Hamilton evolved from a sleepy farming community to the very picture of bustling suburbia, one constant has remained at Klockner and Whitehorse-Mercerville Roads: the Varanyak farm. 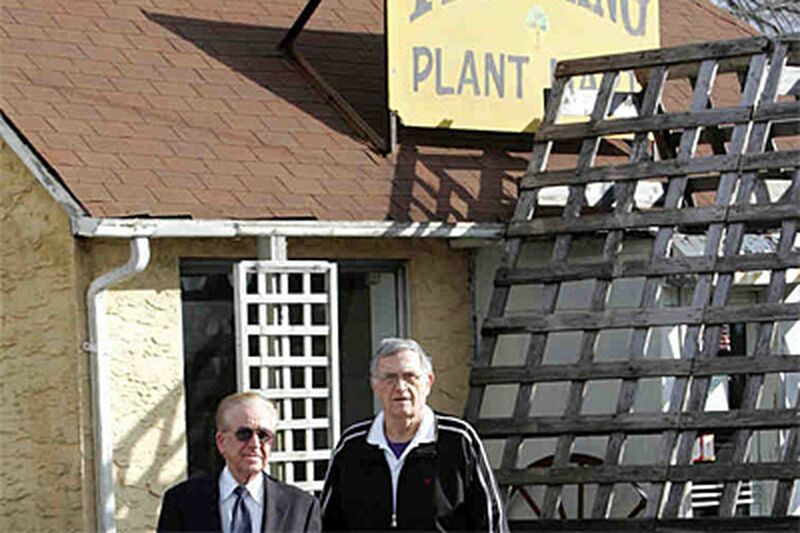 Bought in 1931 by Hungarian immigrants Joseph and Mary Varanyak, the farm withstood the struggles of the Depression, and the development that brought shopping centers, medical offices, and the inevitable arrival of a Starbucks to the area. The land has brought pride to Hamilton - in 2008, a 72-foot Norway spruce planted by Mary Varanyak on the corner of the property became the celebrated Rockefeller Center Christmas tree. But now, 80 years after it was purchased for just $3,000, the property is on the market for $3.9 million. "It's time to hold 'em, time to fold 'em, and time to walk away," Bill Varanyak said. Varanyak, 76, owns the land his parents farmed for corn, peppers, and tomatoes. His identical twin, Bob, has run the Tree King nursery and plant mart on the corner of the 12-acre property since the 1970s. Bill Varanyak reminisces easily about the olden days, when Klockner was still a dirt road, Whitehorse-Mercerville was paved with cobblestones, and Mary's Snack Bar, the little cafe his mother established in the 1940s, was run out of the Tree King's current structure. But with a fondness for the past comes a fear that opportunity has passed the Tree King by, that the still-weak real estate market will leave the property without a buyer as the Varanyak brothers grow older. "We should have sold it many years ago," Varanyak said. "The market fell apart now." The nursery and plant center remain open and will stay open as long as the property is still up for sale. But the business has lost money the last two years, Varanyak said, a casualty of the housing market that went belly-up. When residential housing developments dried up, so did the demand for landscaping and the large orders for shrubs and trees to adorn the new housing units that cropped up in Hamilton during the housing boom. "The few flowers you sell, you work on a very close margin," Varanyak said. "Every nook and crook sells those same flowers, Wal-Mart, Lowe's, Home Depot." So, Varanyak says, it's time to sell. But finding a buyer could prove a tough proposition - the Varanyaks have tried to unload the property before. In 1999 and 2006, the Township Council and zoning officials shot down development plans that would have brought an 86,500-square-foot shopping center, and later a mix of senior-housing condos and office and retail space. In each case, residents pushed back against the proposed development, saying the area was already overdeveloped and heavily trafficked. Varanyak and Realtor Joseph Ridolfi, the broker for the property, say the land, at a key intersection, is primed and ready for responsible development. But the land is zoned for research and office space - no good, according to Varanyak. He and Ridolfi say Hamilton, like Mercer County as a whole, is oversaturated with office space. They have petitioned the planning board, which is undergoing a review of the township's master plan, to change the designation to highway commercial, allowing for commercial or retail development. "There's literally no demand for new office space in Hamilton," Ridolfi said, making mention of what he says is a glut of office space on corridors like Route 1. Changing the zoning "is critical to the development of this site," he said, saying doing so would increase Varanyak's chances of selling "by 100 percent." "He's got a piece of property he can't develop because of the zoning," Ridolfi said. "It's creating a hardship and burden on the Varanyaks." But a few residents living nearby and the township's planning consultant have taken a dim view of the proposed zoning change, saying the last thing built-out Hamilton needs is more retail space. Phil Caton, a partner with the planning firm Clarke Caton Hintz, recommended that the area stay zoned for research and office at a recent Planning Board. The proximity of RWJ Hamilton and a Capital Health offshoot bodes well for the future of medical office space in that area, he told the board. And across from the Tree King are two properties that have been vacant for years: the former Cost Cutters complex and the Whitehorse Plaza shopping center. "I think there's enough retail zoning in that area now," Caton said, a sentiment shared by residents from the nearby Langtree area. "To bring in more commercial retail is ridiculous," said resident Joseph Blando. "Why would you even think about putting in more commercial retail? We disagree with Mr. Varanyak completely on this issue, and we will fight this till the end." An angry Varanyak took issue with those recommendations, telling the board no developer would touch the property if the only option was building offices. "Don't you think I have a right to say why do we have to go with office?" he asked Caton. "I'm trying to bring revenue back to Hamilton Township. What am I supposed to do, take it to the grave with me?" Another resident spoke of the value of living near open space, mentioning the wild turkeys and deer that wander onto his property from the Tree King woods. "It's a quality-of-life issue for me and my family," resident Harold Neil said. Varanyak minces no words when it comes to detractors. His family has lived in Hamilton for 80 years. He's 76, he's not getting any younger, and he wants to sell, period. Why shouldn't he be able to tie up this loose end for his family? "We get all these holy rollers, these Johnny-come-latelys, saying, 'How dare you sell that property, I like that green field,' " Varanyak said. "Lady, the green field is for sale. Buy it."